“Math class is tough!” said Mattel’s controversial and later recalled Teen Talk Barbie in the early 1990s. Appalled, women’s organizations criticized Teen Talk Barbie for delivering a message that math should be difficult for young girls. This oversight by Mattel was a symptom of what would become a national conversation, which led to a platform for education reform in the 2000s. Our current national educational policy aims to increase the number of qualified candidates for highly technical positions and shrink the educational gaps of college graduates entering the workforce. Educational reformers, ed-tech startups, and nonprofits have focused on educating the population in science, technology, engineering, and math (STEM). But there’s a simple answer to the question ‘How do I become better at math?’ which might surprise you: become better at reading. Unfortunately, being unskilled at mathematics is culturally accepted. We’ve all had conversations with someone who visibly winces at a discussion of algorithms, or proudly proclaims “I’m not a math person.” There’s even a popular t-shirt that reads, “I’m an English Major, you do the math.” Our nation both reveres and fears math; it’s reserved for the “smart elite” while the common person quietly exists, willfully ignorant of the utility of mathematical cognition. While many of these statements are ways to dismiss common insecurities, the American public would never celebrate a deficiency in literacy. There is a stigma to illiteracy, and the same should be true regarding deficiencies in math, as it is necessary for innovation and problem solving. One way to counteract this imbalance is to think about literacy and mathematics as two sides of the same coin. Seemingly, mathematics and literacy are disparate subjects, but in reality, they are deeply connected. Literacy doesn’t exist solely in Language Arts classes, and as such, the techniques used to hone language skills should reach beyond English classrooms. Digging into both the biological and environmental influences behind skill development in math and language reveals how our command of language affects our success in mathematical pursuits, giving us the power to overcome deficiencies in both. Scientists have discovered that essentially the same genes in our DNA determine our aptitude in both math and language arts. This suggests that humans are born with an innate disposition to comprehend and construct meaning of words, symbols, and abstract concepts found in algebra, for example. Another study found that the biological base of learning math and language is a single symbolic processing system—the fundamental procedure by which we learn to decode letters, numbers, and signs, and to derive meaning from these symbols. The implication is that the essence of math has much more to do with reading comprehension than memorizing rules. 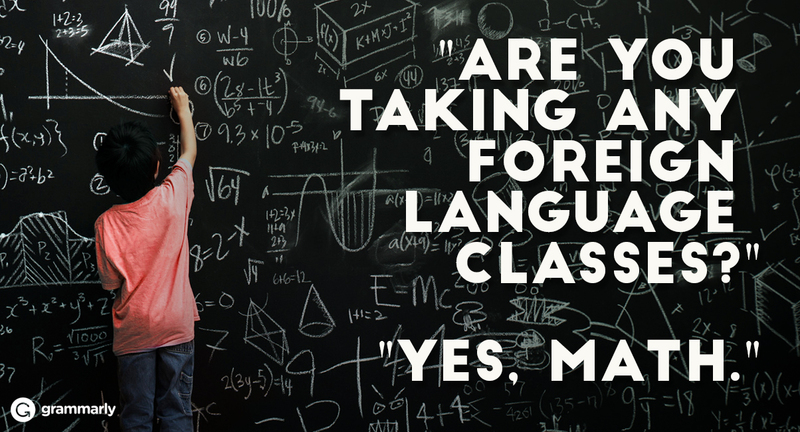 To fully understand this, we need to think about learning math like studying a second language. If we simply memorize the words in French or Spanish, we only know a small sliver of how to communicate in that language. However, we are born with the ability to learn English, French, and Spanish equally well. Therefore, we all possess the capacity to learn math just as we all learn how to read. So those people who reckon they are “just not math people” are wrong. Or are they? While there is a strong genetic connection between literacy and developing math skills, stronger still are the environmental influences, which is why so many people consider themselves unable and unwilling to learn math. Consider this: some children might be naturally skilled at soccer; however, that doesn’t imply that others who are less genetically predisposed to play will never know how to be successful at the sport. It can be learned, but it must be learned and taught appropriately. This same approach can be applied to math. Since scientists acknowledge that the aptitude for developing mathematical skills is directly connected to literacy, reading strategies that teach math should be the most appropriate for learning. Yet, this is much more complex than asking students to memorize vocabulary and formulas. In language arts classes, students are asked to rewrite questions in their own words, to define difficult vocabulary, and to summarize and connect pieces of text in order to demonstrate their understanding and critical thinking. In math classes, this is a rarity often supplanted by rote memorization. Scientists concluded that if students applied reading comprehension tools like translating abstract concepts into their own words, defining difficult vocabulary, and finding concrete and semi-concrete examples in order to make real world connections to what they are learning, these students would ultimately be far more successful in math than they might be otherwise. This was certainly true for Dywayne Nicely, assistant professor of math at Ohio University Chillicothe, whose experiment had high school students enroll in online reading intervention programs in order to improve their ACT scores. It worked; students increased math scores by 15% that testing season. In fact, applying literacy strategies should be the foundation of learning in all subject areas, which leads to the question: why does the educational system continue to isolate subjects so rigidly? When people isolate math from language arts, or believe that literacy has no relationship to STEM skills, they characterize the latter elite, unknowable, and specialized. In fact, people have much more control over their mathematical ability than society would lead them to believe. Science has proven that honing literacy skills directly affects mathematical skills, and this shouldn’t be ignored. Furthermore, literacy isn’t English class. Language arts encompasses more than grammar and literature; it is how we communicate and solve problems by expressing ourselves in the best language possible, be it English, image, or even algorithm. Therefore, it is clear that the best practices in literacy education should be applied in all subjects, and from there, we can build a culture that lessens the mysticism of mathematics, making all of us “math people,” or simply people…well-rounded and well-educated. WritingWhat PS Means and How to Use It Correctly in Your Email WritingWhat Is the Oxford Comma and Why Do People Care So Much About It? Writing“Dear Sir or Madam”—Learn When to Use It and Some Alternatives Writing3 Perfect Examples of How to Write an Apology Letter Writing7 Clever Ways to Say "I Look Forward to Hearing from You" Writing5 Better Alternatives to "I Hope This Email Finds You Well"